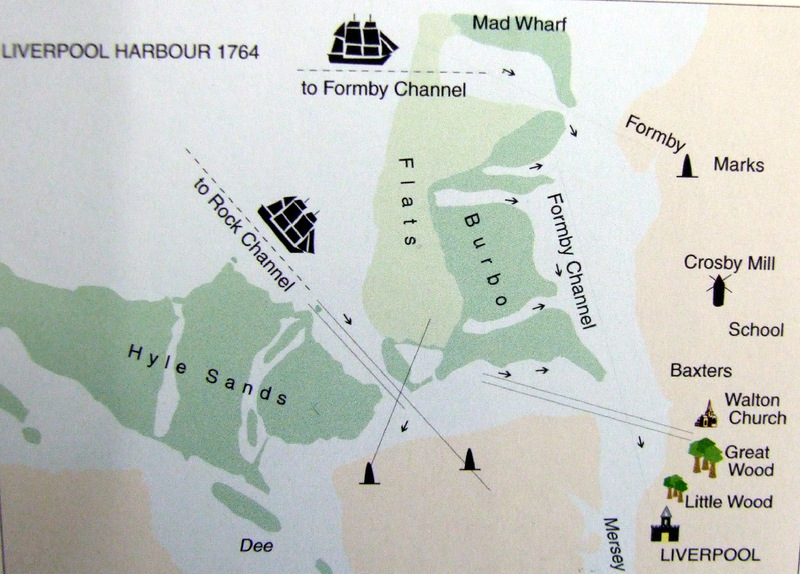 In 1762 the route into Liverpool for shipping was via the Horse (or Rock) Channel into anchorage at Hoyle Lake, then hugging the North Wirral Coast to Dove Point, seaweard of the present Meols, rounding the point at New Brighton and crossing the Mersey to Liverpool. Then, as now, sandbanks were a hazard and it was vital that shipping followed the deeper channels to avoid the chance of running aground. In 1763 two lighthouses were built at Mockbeggar (Leasowe) as well as two at Hoylake. If navigators kept the first two (“Sea Lights”) in alignment, they could sail safely through the Horse Channel. 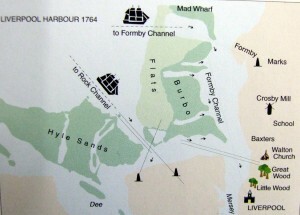 When the two at Hoylake (“Lake Lights”) became aligned the ship could change course to find safe anchorage at Hoyle Lake. The inner Sea Light at Leasowe was black and white, about 100 feet high whilst the outer one was movable and made of wood, only 25 feet high. This meant it could be moved to match the current location of the ever changing sandbanks. The outer one was lost around 1771 and was not replaced as they had already noticed, when William Hutchinson conducted experiments with a light enhanced with mirrors from the roof of the wooden flag-signal building, that Bidston Hill was also in line with the Sea Lights. When the first lighthouse was erected in 1771 this became the new inner Sea Light and the original inner Sea Light became the outer one.